Stock photo of Slocan Lake at sunset from the town of New Denver, Slocan Valley, Central Kootenay, British Columbia, Canada. Slocan Lake at sunset from the town of New Denver, Slocan Valley in Central Kootenay. 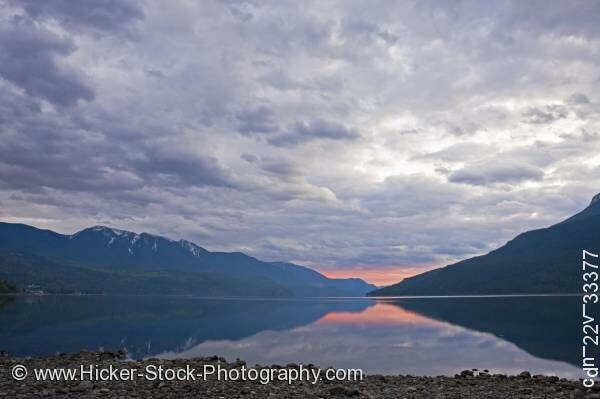 This stock photo shows the evening scenery of the Slocan Lake from the town of New Denver, Slocan Valley, Central Kootenay, British Columbia, Canada. A lovely evening from the town of New Denver is a scenic view of the beautiful calm blue waters of Slocan Lake. From the rocky shoreline shows a view of the lake in the Slocan Valley surrounded by the rugged mountain coast. The dark mountain range reveals snow capped peaks. Heavy storm clouds settle over the gorgeous mountains and the Slocan Lake scenery. This wonderful scenic view has soft pink hues of the sunset that sit low on the horizon and reflects on the calm lake. The dark mountains and puffy clouds reflect on the lake’s calm surface. Slocan Lake at sunset from the town of New Denver, Slocan Valley, Central Kootenay, British Columbia, Canada.